Do You Have Your Car Decals? 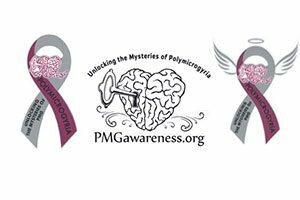 Raise Awareness for Polymicrogyria with these beautifully custom made PMG Awareness Car Decals! 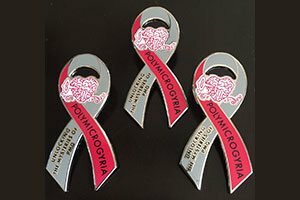 These decals were created to bring attention to our uniquely created awareness ribbon and logo as well as to help promote knowledge and understanding of Polymicrogyria within our communities and across the globe! These decals proudly boasts our original Pantone Pink color symbolizing PMG as well as our Pantone Grey color symbolizing Brain Disorders. All decals are made with premium vinyl which is laminated to allow for optimal outdoor usage. It is weather resistant and will withstand repeated car washings. The Awareness Ribbon is approximately 8” in length and 4” in width. The Angel Wings Awareness Ribbon is available in the 8” by 6” as well as 5 ½” by 4 ½ “. The Logo Decal is approximately 6” long and 8” wide. Show Your Support with PMG Lapel Pins! Our beautifully Custom Crafted Cloisonné PMGA Awareness Lapel Pins are a great addition to any outfit, handbag, backpack, hat etc. The ribbons are 2” in height and 1.2mm thick. They are made with a durable silver metal plating and have an 8mm post with a rubber clutch attachment. Each lapel pin will arrive packaged in an individually poly bag. PMGA 2019 Calendars Are Still Available! Never forget a birthday, anniversary or special event again! Our 2019 PMGA Calendar is the perfect way to stay organized and up to date. 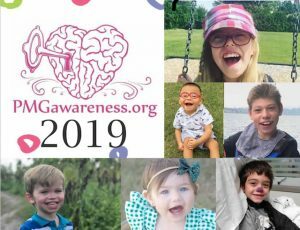 Whether you need a calendar for your home or office, this PMGA calendar showcases many of our amazing children who truly are our special blessings! They are a must needed addition to any home or office and are a great way to raise awareness for PMG. They also make great gifts for families and friends. Get yours today! 2020 Calendars coming in November 2019!